Our latest automated DVD and game machine is designed to meet not only the engineers´ criteria, but also the specific needs of our customers and market requirements. Our machine has 3 new patents which offer unique benefits: innovative semi-circular storage area; increased rental speed; rapid-return system. - The machine works for you 24 hours a day, 365 days a year. - The new system allows you to store 4 DVDs in the same space as 1 VHS. This provides a storage capacity of up to 1500 DVDs in less than 2m². - As the only machine available in the market with interactive keyboards, customers are able to register as a member 24 hours a day, directly at the machine. - Two TFT flat screens and keyboards allow users to simply browse, select and collect titles, without the need to move. 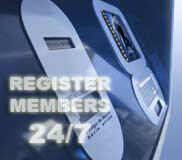 - Users can access the system with or without their membership card by keying in their username and pin number. - Membership cards are economical and safe as they are bar-coded. - Customers have the choice of increasing credit on their membership account at the machine using cash, credit or debit card. 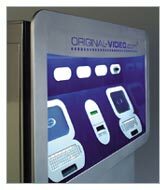 - The machine allows users to also buy movies or games, generating profits by both renting and selling. - The machine’s software allows for operator promotions e.g. a ‘viewer’s day’, allowing a reduced cost of the rentals on any chosen day. The software can also be programmed to charge different rates depending on the time of day. - Intelligent software with an automatic age restriction system that allows the user to only browse through titles appropriate to his/her age. - With two TFT flat screens the machine can be easily programmed to show continuous advertising 24/7. This can be used for the store itself, or can be sold to third parties at a fee to generate extra revenue. - Robust structure, high resistance and durable. Designed to withstand the hardest external conditions, with vandal-proof glass and paint.